Life is too short to spend looking for your wallet and keys. Save that precious time and get TrackR. Go to TheTrackR.com and enter promo code TWIST to get 20% off any order. Billions of dollars are gushing into ICOs (Initial Coin Offerings). But with every dollar emerges more questions about what purchasers are actually getting. And as reality sets in, the law suits begin. (To wit: Tezos, on this program for after raising their record $232m in July, was just sued by CA Superior Court for violating securities laws & defrauding participants.) Today’s guest, Andy Bromberg, hopes to steer this runaway train with CoinList, a new financial services one-stop shop for compliance, anti-money laundering, vetting, investor accreditation & more. A collaboration of AngelList & Protocol Labs, CoinList ran Filecoin’s $205m+ ICO and now operates independently to host ICOs at large. Andy and Jason talk about the risks and rewards of this explosive market. 0:01 Thank you to our partners Squarespace & Trackr. Go to http://squarespace.com for a free trial, then use the promo code: “twist” to save 10% off your first purchase. Go to http://thetrackr.com and enter promo code “twist” to get 20% off any order. 1:02 Today’s guest is Andy Bromberg, Co-Founder & CEO of CoinList. Topic of discussion: Tokens/Coins. 1:37 Q: what is CoinList? A: where the best digital asset companies run their ICO. 2:45 Andy explains CoinList services. First is ComplyAPI. There are three aspects of compliance: know your customer, anti-money-laundering, and investor accreditation. 5:27 Second service is Full Sale Facilitation, which handles the sale start to finish. 6:25 What is a SAFT? Andy explains the similarities and differences compared to a SAFE. 7:21 How was FileCoin able to raise $205M without product? Jason & Andy share concern for raising so much $ pre-product. What is the difference between FileCoin ICO & majority of ICOs? 9:41 Thank you Squarespace for supporting TWiST. Go to http://squarespace.com for a free trial, then use the promo code: “twist” to save 10% off your first purchase. 11:54 How does CoinList ComplyAPI determine if a terrorist organization or dictator is using an ICO for profits for illegal purchases (weapons or bombs)? 13:33 How can ICOs prevent identity fraud? And why are certain ICOs being investigated now? 15:30 More ICO concerns! Celebrity endorsements, misrepresentation. 16:47 Jason shows an existing click-baity ICO ad, which focuses on economics of the sale rather than the actual technology or product. Should people be buying ads for an ICO? 19:33 Andy explains why it’s important for more “non-crypto” people to support ICOs. 21:25 What is CoinList’s relationship with the SEC? 23:13 Explanation of the large finders fees with ICOs. What’s the deal? 27:30 Thank you to Trackr for supporting this podcast. Go to http://thetrackr.com/twist to get 20% off any order. 31:32 Jason asks Andy: what % of someone’s net worth would you advise to put in an ICO? As with any investment, you should expect your money to go to zero. 35:50 Can you freely trade tokens from an ICO? How long does it take to see a return? Andy explains secondary exchanges for ICOs, allowing you to sell your tokens. 40:34 Introduction to Blockstack and why CoinList decided to run their ICO. Explanation of benefit corporation. 43:00 Big names are backing Blockstack. How much is the ICO expected to raise? 47:20 What is the number one token in the world? Andy reiterates importance of Ethereum. 53:13 Jason gets heated over billions being invested into tokens without having any product. Andy counters with great use cases for ICOs. 56:24 ICOs/tokens have: “incredible potential, filled with bad actors….”. Jason makes comparison to Internet in 1994. 57:40 Jason asks Andy if he should participate in the ICO/token boom by launching his own coin (J-Coin). Andy advises otherwise…for now. 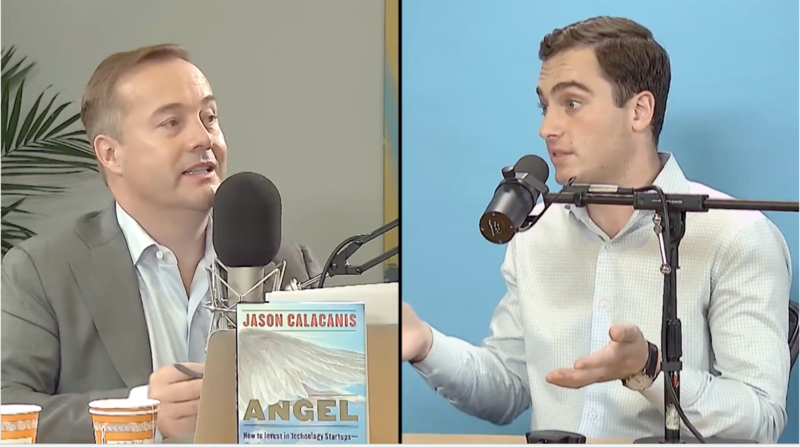 1:00:04 Jason thinks he can raise a $100m token fund, comparing his Angel Investing track record to Tezos, with no track record. Andy explains the difference. 1:03:00 Are people buying tokens for a positive future return, or are they buying them for utility? 1:05:32 Jason advises to put 1% (of net worth) into ICOs, and 5% into early stage startups (spending 10 hours/week). 1:07:39 What are the chances of Bitcoin going under $1000? Are forks concerning? Bitcoin v. Ethereum?